It's a battle between a Royal Paladin deck, and a Dark Irregulars deck, with a spot at the National Championship Tournament at stake. Cardfight! Vanguard episode 32 concludes the qualifying matches for the National Tournament. Aichi fights “the General” of the Foo Fighter’s team AL4, and the game turns out to be a good one, with a rather shocking conclusion. 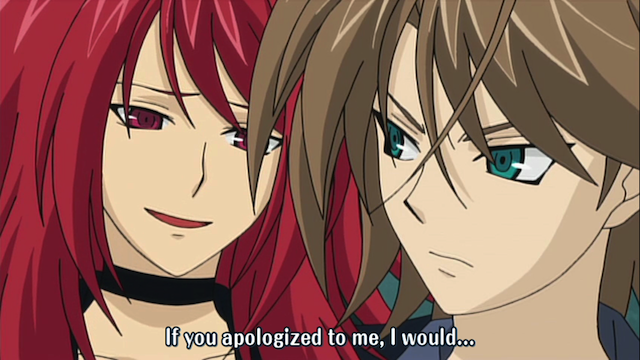 Also Ren Suzugamori shows himself to be a mean jerk. Tetsu, the Demon World General of Team AL4. 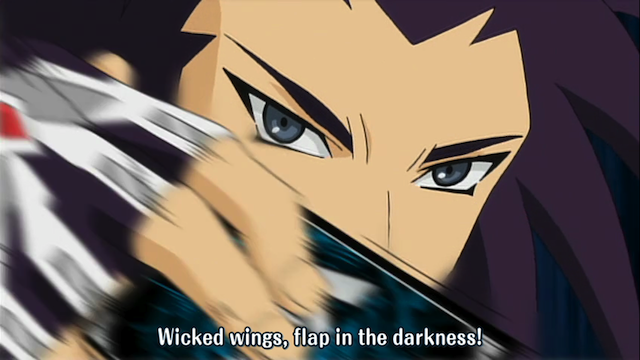 Aichi’s opponent is, indeed strong, and though Aichi plays well, it just isn’t enough. Tetsu continues to build up “soul” in the early phase of the game, and then rides a vanguard that converts soul to power. 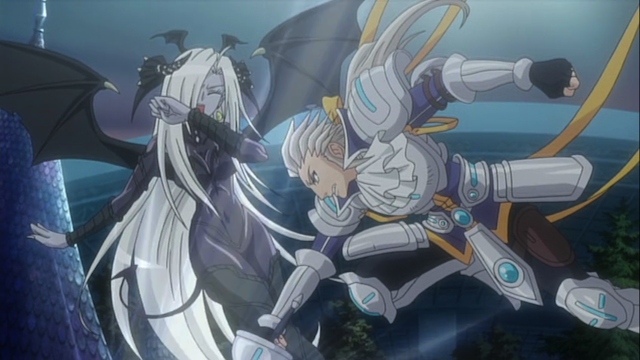 A vampiric attack replaces Aichi's vanguard with the nearly useless Llew. Tetsu’s final strategy is a special attack that replaces Aichi’s level 3 vanguard with a rear-guard unit of his choosing. 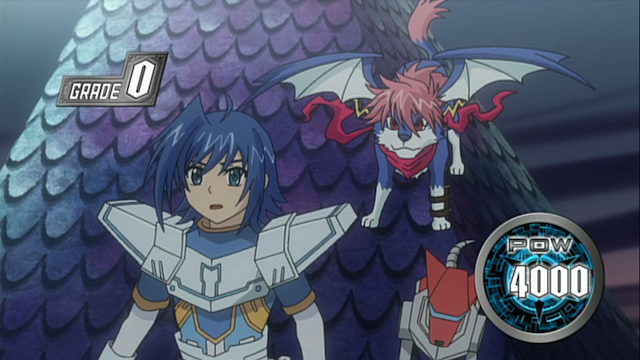 Unfortunately, Aichi had a level 0 unit, Llew, the future knight, in play. Doh! Beyond the diminished power rating, Aichi has a crippling deficiency. He can only call defensive units to block attack that are at or below his vanguard’s level. If he had only level 1 and above in the rear guard, he could have defended this round, and possibly won the match. But he didn’t. Aichi loses the match, and Team Q4’s chance to enter the National Championship. 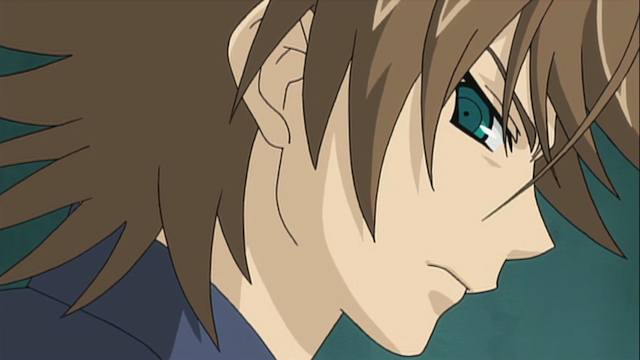 Kai Toshiki, he always looks pissed off, but something has him in a particularly bad mood. 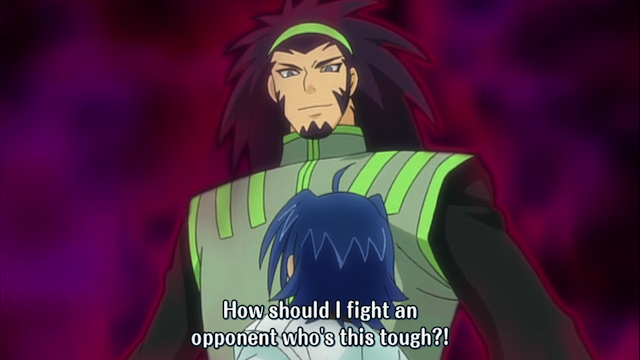 Aichi Sendou, weakest member of Team Q4. Ren sure knows how to be a jerk. After Team Q4 loses the chance to move on to the National ornament, he shows up to gloat. First he tells Kai that he might be allowed to join the Foo Fighters, if he apologizes for something. Kai acts characteristically cool, and walks off. The Ren gets in Aichi’s head. 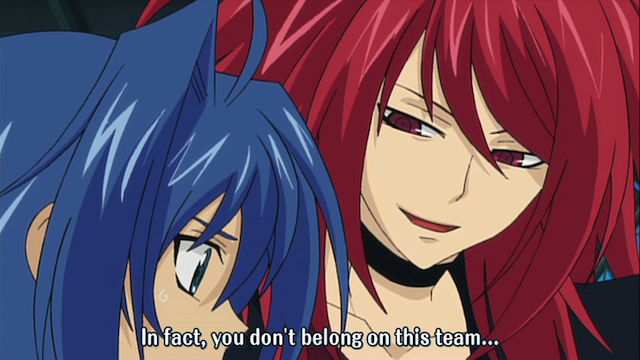 He tells Aichi that he is the reason Kai won’t be allowed to play at the Tournament. 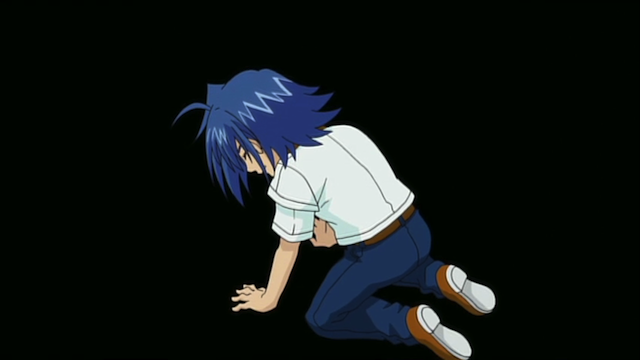 Aichi seems to have lost his confidence completely. At any rate, the team has lost their chance to move on, so his playing skills won’t be tested for a little while at least. I REALLY did not expect things to turn out this way. The show pretty cleverly played up several possibilities for things to turn around, an inspirational memory of Kai teaching him to “imagine”, an encouraging shout from Kamui, and then the advancement by judgement, but none of it was enough. I’m definitely impressed that things turned out this way, as I was sure Team Q4 was going to enter the Tournament. This makes the next few weeks completely unpredictable. I’m looking forward to seeing what happens. I mentioned before about seeing Tantei Opera Milky Holmes cameos SEVERAL times. I was a bit unsure of what was happening. The writers and directors were different. Even the animation companies are different, so I didn’t know why the cameos were put in there. I finally found out that Bushiroad, the company that makes the Vanguard trading game, also owns the Milky Holmes franchise. I dropped Milky Holmes after 3 or so episodes, so I guess I’ll just chalk it up to a marketing gimmick, although it seems a weird tie-in to me.